Choosing the pocket holster can be a difficult task. There are so many options out there that it can become disorienting to consider all of the possibilities, but with a little research, you can make sure you are getting the best pocket holster for your money. 1 What is a Pocket Holster? 2 Why Do You Need One? 3 Why Use a Pocket Holster Over IWB? What is a Pocket Holster? As the name would suggest, a pocket holster is a handgun holster that simply fits inside of your pocket. There are several reasons to choose to use a pocket holster for simply carrying your handgun in your pocket. You should never carry a handgun in your pocket without a proper holster. A pocket holster serves a number of purposes, but its primary job is to make sure that you and the people around you are safe. A pocket holster should keep the safety from ever being accidentally toggled which could result in an accidental discharge. When it comes to gun safety you can never be too safe. You are statistically more likely to be harmed by your own gun than someone else, so always be sure you are following proper safety procedure. Why Use a Pocket Holster Over IWB? With IWB holsters being so convenient why would you choose to use a pocket holster instead? Well, there are a few advantages of using a pocket holster over an IWB. The first, and perhaps biggest advantage of a pocket holster over an IWB holster is ease of use. An IWB holster requires you to clip the holster to the inside of your waistband. This involves wearing oversized clothing and can be uncomfortable if you are wearing it all day. While an IWB holster has to be strapped to your waistband, a pocket holster simply slides into your pocket. Thanks to this you don’t have to worry about buying larger clothes for when you want to carry, simply put it in your pocket. This makes a pocket holster a much easier to use and convenient option over an IWB. The first holster to make the top three list is the Desantis Ambi Nemesis holster, henceforth known simply is the Nemesis. 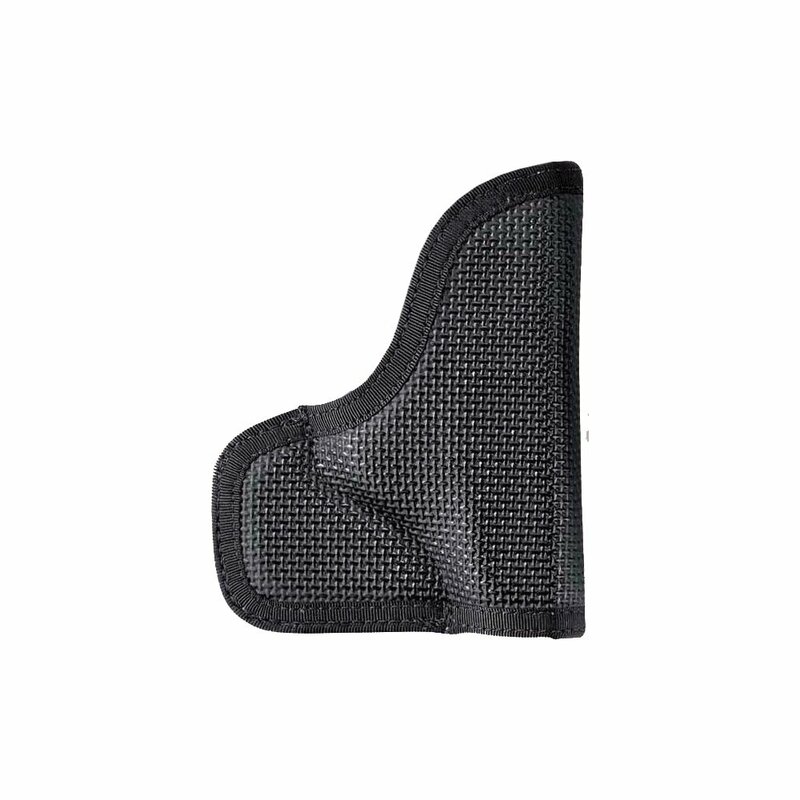 It is an ambidextrous pocket holster that boasts a low friction liner material to reduce draw friction. This means it is going to be easier to draw your handgun and you are not going to drag your holster along with it. This is a common issue with cheap holsters. They use a rough material on the inner liner and it does not secure to the pocket, so when you go to draw your gun you get the entire holster with it. This is not the case with the Nemesis, it uses a rubberized outer liner to grip your pocket and keep the holster inside. The Nemesis is filled with foam to help blend the line of the gun and prevent printing. They do this by providing just enough foam to blend the lines, but not so much that it results in a bulky look or feel in your pocket. This can be as much of a giveaway as printing and can be horribly uncomfortable, but the Nemesis stays slim. Rubberized outer liner to maximize pocket grip. Low friction inner liner to prevent the holster from grabbing your gun when you draw. Packed with foam to prevent printing. Muzzle end of the holster is not stitched, this can allow lint into your barrel. Stitching can catch on sights. The Sticky Holster is a small, ambidextrous pocket holster that is designed to be used with most small semi-automatic handguns up to 3.5”. This makes it a great choice for carrying a small handgun in your pocket without detection. The holster is more likely to move around in your pocket, however, since it relies on the tension in your pocket to retain the holster. This means there is a good chance of your holster coming out along with your gun in the event you need to draw your gun. While not likely, this is something to keep in mind when considering this holster. 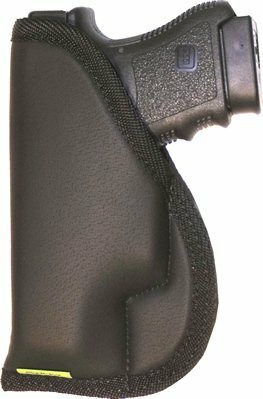 This holster can also be used as an IWB holster, not just a pocket holster. This is thanks to its “sticky” design. It can sit in your waistband and will be held in place by the friction from the soft rubber liner. This is likely to be more effective as an IWB holster than a pocket. holster, but will serve both purposes quite well. The Sticky holster does an excellent job of blending the lines of your gun when used as either a pocket holster or IWB holster. It is not heavily padded, so it will not add bulk, but it is blended well enough that it will not leave any sharp, noticeable lines in your clothes. Dual purpose can be used as a pocket holster or IWB holster. Light, weighing only 3 ounces. Can come out of your pocket on draw. Too small for many handguns. This is a different model from the earlier Nemesis but carries the same name moniker. This model is designed specifically for the Smith and Wesson Bodyguard .380 and is an ambidextrous holster. The outside of this model, similar to the Nemesis, is made of a high friction rubberized material to reduce movement and slippage when you draw your gun. The material is a very soft rubber that allows it to catch onto just about anything with ease, but it will wear out fast if tossed around on hard, course materials. The foam in the holster does a great job of keeping your gun hidden when it is in your pocket. This small amount of foam is not likely to add a noticeable amount of bulk to your pocket, so it should keep you comfortable even when you have it in your pocket all day long. The inside is a stark contrast to the outside liner. It is made of a low friction material to allow you gun to slip out easily when you draw. Don’t take this to mean, however, that you gun is simply going to slip out of your holster in your pocket. The holster is snug enough around the gun to prevent this from happening. Low friction interior liner for easy draw. No clip to secure it in place relies on friction. Model specific for Smith and Wesson .380. When you are looking for the best pocket holster on the market there are a number of choices, but the top one on this list is easily the Nemesis. It offers a wide range of support for different models and sizes of handguns and is able to easily be hidden in your pocket. If, however, you own a Smith and Wesson Bodyguard .380 then you may want to consider the N38. It offers all of the advantages of the Nemesis but is made specifically for your gun. This means that you don’t have to worry about small oddities about your model causing catching or premature wear on your gun or holster. Last, if you are looking for a holster that will offer maximum flexibility then the Sticky Holster may be right for you. It may be restricted by the size3 of handgun it is compatible with, but it makes up for it by being a well-rounded holster. With this one, you can use it on either side and as an IWB holster, not just a pocket holster. Will the Desantis N38 specific for the S&W Bodyguard 380 work with my model equipped with the Crimson Laser? Will my Bodyguard Crimson laser above work with the Desantis Pocket ShotHolder? I am left handed. So will be using my left side pocket.